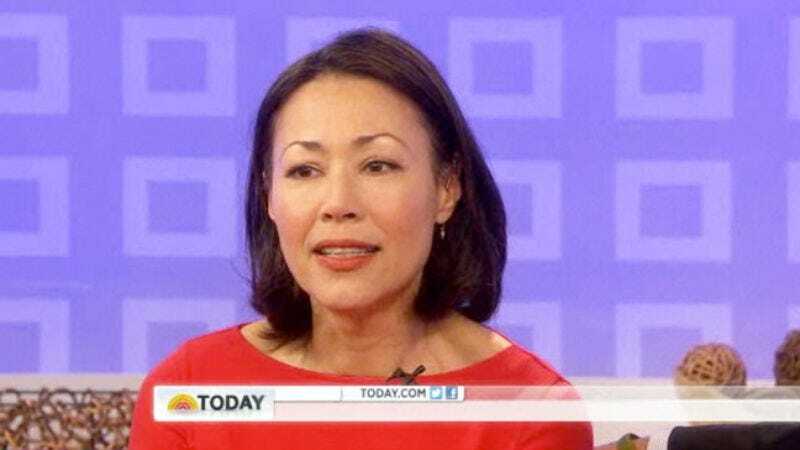 Bringing a not-so-revelatory end to one of the worst-kept secrets in show business, Ann Curry officially said goodbye as co-host of Today, the culmination of weeks of rumors that she was being ousted from a job she had assumed only a year ago. In that time, of course, Today lost some of its ratings dominance, and both critics and viewers noted a lack of that ineffable "chemistry" between Ann Curry and… well, the majority of human beings, but particularly Matt Lauer, who has been the subject of numerous reports claiming that a stipulation of his recent contract renewal was that Curry be replaced. He'll get his wish—or at least, the nearest best contingency plan—when Savannah Guthrie takes over Curry's spot. Curry addressed some of those reports in a recent USA Today interview, saying they "hurt deeply," and that same emotion tinged her farewell this morning: A teary Curry (K5 on your menu, specify medium or extra spicy) expressed gratitude yet seemed defeated, saying, "For all of you who saw me as a groundbreaker, I’m sorry I couldn’t carry the ball over the finish line. But man, I did try." Meanwhile, Lauer sat quietly to her side looking slightly lordly and indifferent, robotically recited the same praise about Curry having "the biggest heart" that he's made in previous interviews, then offered a benevolent kiss on the head, all while Curry pointedly refused to make eye contact. It was definitely a marked contrast to the farewell offered to Curry's predecessor, Meredith Vieira, whose goodbye took up two full hours of gushy tributes. Curry instead received around five minutes to wrap up her hosting career mid-show, slotted among stories about weight-loss drugs and a Matthew McConaughey interview. Not surprisingly, some pundits are already comparing Curry's hasty firing to that of Conan O'Brien, pointing to it as yet more evidence of NBC making rash decisions it wouldn't be making if it weren't currently flailing about over its ratings, and pinning everything on a scapegoat, rather than, say, increased morning show competition or an inevitable fatigue with Today's four-hour slog. And yet, plenty of others seem to have agreed with those NBC executives who were first rumored to believe Curry came off as "strained" or even "atrocious" in the position: As her departure became all but a foregone conclusion, a petition to save her job scored only around 26,000 signatures, and most of those in the past few days. Anyway, whether Curry's forced exit is the result of NBC's panicking, or the fact that much of America believes she is secretly a robot who wants to eat their gold, is now beside the point. Curry, borne on the wings of a reported $10 million severance package, has now been dispatched to be Today's "anchor-at-large," which will put her back out in the field covering the hard-hitting, people-shooting-at-each-other international news stories that are perhaps better suited to her particular personality. NBC is, of course, spinning it as giving Curry her "freedom"—specifically the freedom to go to places like Syria and stop making them uncomfortable.